Following the loss to Malmö two weeks ago I asked some big questions of the Lugi men’s team. Our forwards were asked to take responsibility for their poor performance in the scrums and lineouts. Our backs were asked to organise themselves in defense, particularly out wide. As a team, I highlighted the detrimental effect that our flagging spirit, poor communication and ill-discipline had on the result of the game. I am pleased to report, dearest reader, that these questions were answered in a resoundingly fashion at the four training sessions that followed: the Anderssons, Niklas and Magnus, threw at the crossbar for forty-five minutes before every session; our backline cohered under the tutelage of Sylvain Touze and Antonio Privetera; and our ghost rugby was some of the most fluid I have seen. Going into the game on Saturday I was quietly confident that we were fielding the most committed and spirited Lugi men’s team seen for many years. Karlstad, having had experience at a higher division, were expected to play with considerable force and experience. They would be a big team; heavy in the forwards, strong at the set piece. And during the first twenty to thirty minutes, Karlstad did indeed have the upper hand. They attacked well at the fringes of the ruck, their first-five was dynamic in space, they were opportunistic in returning our probing kicks and their crashball centre was vicious when crashing the ball – with Lomuesque ease he at one point bumped “Catt” Cordes somewhere into the second half. But the Lugi tackling was again superb. “Sticky Fingers” Lednor let no one go untouched. Similarly “No Homo” Mytton, “Preacherman” Imberg and “Who?” Jewitt. Again our defensive organisation was sloppy early, but again we were lucky and our opposition failed to take advantage of opportunities out wide. As their big men failed to make ground, frustrations mounted for the Karlstad side. Their line turned flat and beyond third phase their tactics dissolved into little more than hit the fringes and draw the penalty. Sustained pressure was rewarded for Lugi as poor communication in Karlstad’s attacking line allowed Sylvain “The Schnoz” to pinch the ball from between his opposite centres and run-in a 60 meter try. He was shortly thereafter interfered with by “Sticky Fingers” Lednor (much, so I’m told, to the consternation of some envious Lionesses) and had to spend the remainder of the day in Lund Universitetssjukhuset’s infamously tardy emergency waiting room. Set pieces were a great improvement on last week. Despite being lighter man-for-man, good technique ensured that Lugi put on an entertaining scrum battle. Our early dominance forced Karlstad to sacrifice fitness in the front row for strength and experience. Their interchange – while welcomed to the park in proper front row fashion – soon settled and Lugi found themselves going backwards. This insecurity continued for the remainder of the game. Our failings were due to this powerful tight-head, but also to an improper engage at the second row. Scrummaging is where the tone of the match is often declared and your humble match-report-writer feels saddened that we had no parry or ripost to counter this Karlstad thrust. Lineouts were fantastic to watch. Niklas “Phil Kearns” Andersson has developed an astoundingly accurate throw in the last two weeks. With “Jack” Carlsson as the front jumper – and his sturdy prop-lifters either side – we seem to at last have found the solution to our lineout problems – a combination that will weather the loss of our exchange students in coming weeks. In the second half we were able to win or disrupt many Karlstad balls and the only error on our part came at an uncontested short-man throw to four. Not bad at all considering what we saw in Malmö. With a solid platform “Chip” Thylander was able to settle into the patterns of strong communication and reliable phase turning for which he is fast becoming known. The speed with which our plucky Swedish scrum half continues to learn our great sport is astounding and the mistakes he makes, need to be made; they are mistakes that everyone makes early in their rugby career, the mistakes he has until now, not had the opportunity to make. Developing a backline requires exposure to rugby and so we will endeavor to maximise this by focusing on full contact drills in coming weeks. For the last ten minutes of the first half and the first thirty of the second, Lugi kept the ball in hand and played an entertaining and entrepreneurial brand of rugby. “General” Andy Mackay was brilliant in moving the ball around the park. On Lund’s short home ground his kicking game continues to impress; on more than one occasion it was the “General’s” boot that got us out of trouble. It was, sadly, Andy’s last game with the club, and his presence will be sorely missed. “The General” has the ability to attack in the same direction, building the tension until the gaps open up and the ball can come back open – a fact for which “Parisse” Cifani owes his first try of the day. But he was not the only person making territory in the backline. “Catt” Cordes, while sloppy early, dropped his shoulders in the second half and had little difficulty drawing in the defenders and creating space out wide. You will forgive him, I’m sure, if he only made one pass all day: a backhanded flick out of contact that trickled past its intended receiver only to be gathered by Alec “JP” Rose and run-in on the flag. It was a miraculously fortuitous try and I was tempted by it to award the (not entirely sarcastic) nickname of “Sonny Bill” Cordes. I will however save this precious antipodean accolade for a later date. Proper recognition for ball disposal in contact must go to Adam Borg. 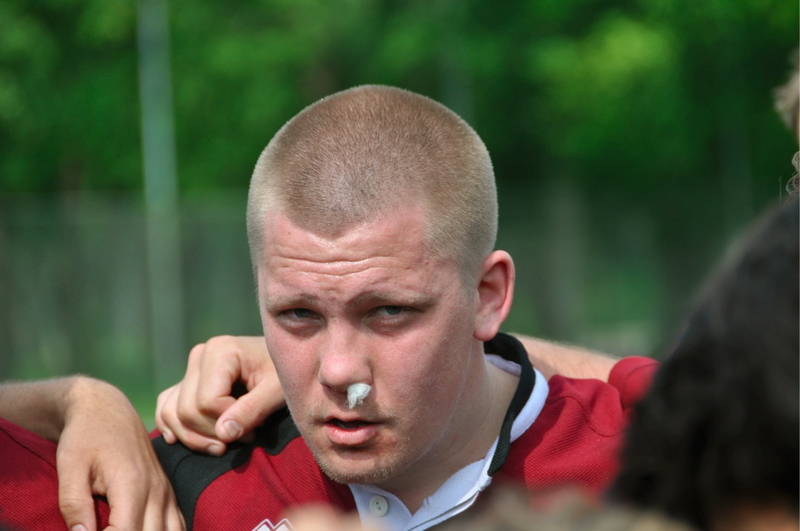 Coming on as a replacement for “The Schnoz”, Adam played first at centre and then at wing. In both positions he displayed his quiet but uncanny gift for the game, both in defense and in attack – on several occasions he was able to offload the ball and keep the phases turning well beyond the point they had any right to do so. Surely his performance this weekend dispels any questions his absence from the game might have raised. While not the quickest outside back in our lineup, Adam also taught us another important lesson: to paraphrase “Parisse”, the wingers are a one-bullet shotgun fired at the corner flag and should carry the arrogance to think of themselves as such. Back yourself. Having forwards with experience in the backline is a massive advantage when ball security is good and the phases start building. When he wasn’t busy dazzling us with his oratory and musical gifts, “Jack” Carlsson reminded us that he is in fact quite handy with the ball in hand. Slotting into second five-eighth he was instrumental in shifting the ball wide and opening up another dimension of the Lugi attack. All of these factors played an important role in what was undoubtedly the try of the day. From kickoff “Who?” moved it open to “Sticky Fingers”. Never one to pass up the opportunity to score, “Sticky” penetrated deep into the soft defenses of the Karlstad pack, picking up a good 30 metres before reaching his climax. The ball was shifted left through the hands, drawing Karlstad defenders in tight to the breakdown. The ball was shifted right and “Parisse” evaded the scattered defenders to score his second try for the day and put Lugi well in front. Karlstad mounted a late come back but were unable to reel in the scoreline. At the final whistle, the game finished: Lugi 27, Karlstad 17. While there were a great number of positives to take from Saturday’s game there remains one glaring frustration: discipline. A good player will concede penalties to test to the referee. A great player will learn from this and adapt their tactics accordingly. “Sticky Fingers” Lednor was time and time again caught with his fist in the jam jar. “Parisse” Cifani was not much better. Now make no mistake, our flankers were crucial in our victory. Any flanker who doesn’t give away penalties is not worth their salt and these guys were everywhere on the park, all day. But between them, we saw a penalty count well into the double figures. This needs our attention. Discipline was the reason we were starved for possession in the first half; we are lucky that the story was different in the second. Man of the match went to Antonio “Right-hand” Privetera for his brilliant poise, communication, defensive oversight and initiative in attack. It is rare that a player has the perfectly rounded game and it is important that it is acknowledged when it happens. While he may not have been scoring tries or breaking lines, “Right-hand” was absolutely the most reliable and consistent man on the park. Final score: 27 to 17. Points: Paolo Cifani, 2 tries; Alec Rose, 1 try; Sylvain Touze, 1 try; Andy Mackay, 1 penalty, 2 conversions. Best on: Antonio Privetera. This result sees Lugi takes the top of the Division One table. But with the loss of several key players and two approaching away games it is crucial that we not become complacent. Training and dedication from us locals is what matters now. It is crucial that we consolidate our position on the table; that we continue to show how hard work during the week brings results at the weekend. A big thanks and shout-out must go to the exchange students leaving us before the next game: Connor “The Butterfly” Clark, Javier “Lungs” Heredero, “General” Andy Mackay, Tim “No Homo” Mytton and Alec “JP” Rose. You have been fantastic in building the character of the team. We wish you the best of luck and hope to see you all in the future. Cheers lads. This entry was posted in Match Report, Men's Team, News on May 31, 2011 by Jim. Just a quick note to fill you all in on activities at Lugi this week. Tonight, naprapath David Havia will be down at the club to look over aches and pains. If you have any lingering injuries, acute or chronic, he will be happy to look over them. David is providing us with a fantastic service out of the kindness of his own heart. If you need further assistance his clinic is the place to go: http://www.lundsnaprapatklinik.se/. This Thursday is Kristi Himmelfärdsdag, a public holiday in Sweden. At 1pm the girls will be kicking off in Trelleborg. I urge all mens players and Lugi groupies to get down and support the girls in this titanic inter-skane battle. This Saturday the girls are playing some 7-a-side games from 10am in Göteborg. 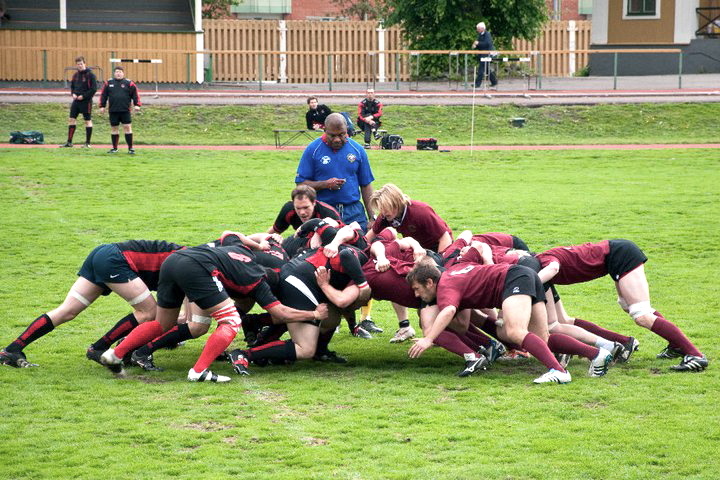 The men have plans to have an interclub game this Saturday – perhaps a Swede vs foreigner hit-out before the exchange students all go home – but we will fill you in on this at training. If not, perhaps some August-led-army-style-boot-camp fitness. I’m sure that will be fun. This entry was posted in Management, Men's Team, News, Women's Team on May 30, 2011 by Jim. The second chapter in the story of the women’s 2011 15’s season took place on a Saturday with good rugby weather. Not to warm, not to cold, windy but not so windy that you couldn’t throw decent passes. Our pitch showed itself from it’s softer side thanks to the all the rain that had fallen. So we gladly ran out on the pitch to take on the visiting ladies from Uppsala. Kick off at 1 pm with Lugi as the ball receivers. The first half of the first half is rather muddled in my mind, but I think the muddle gives a fair picture of what happened on the pitch. We as a team, collectively, became chocked and bewildered by the brawn and the size of our opponents. Somehow it seemed like those of us whom have played against Uppsala before had forgotten how big, hard hitting and heavy they are, and this contributed to our confusion. Their early, and all to easily made try, did nothing to take us out of this mindset. For quite a while we stressed and fumbled every time we had our hands on the ball. We stopped listening, looking and thinking. To make matters worse our captain, Anna Thynell, got injured and had to go to the A & E. 14 lionesses remained on the field. Slowly we found our way, every ball we lost made us more determined to get our heads, and hands, back into the game. Every try scored by Uppsala gave us more will to stop them, to work harder as a team. We started to look, listen and stopped stressing out. By the end of the first half we were truly back in a good mindset and it started to show. During the second half we continued to improve, playing better and better. No matter what we faced we continued to work hard, pushing ourselves, defending our try line and trying to break through the opponents lines. 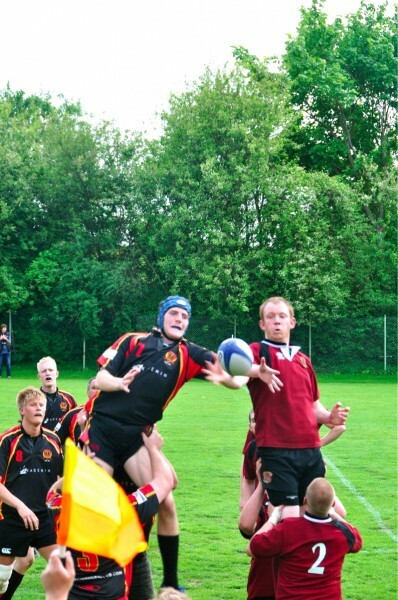 Throughout the game our lifting in the line outs was perfect and the passing in the back line was spot on. Our will to go in for the tackles, help out in the rucks and trying to stop the mauls was heart warming. The second half of the second half was a period when we became fewer on the pitch. Lisa Hulthén, who made a fearless and well executed debut as a winger, had to leave for work. 13 lionesses remained on the pitch but we took heart from the sight of our captain, whom had returned to the side line with a few stitches on her forehead. Towards the end we lost two more players in rapid succession. Both of them forwards, so the last scrums were uncontested. When the final whistle blew 11 lionesses remained on the pitch. In most of the stories we are told as we grow up the little guy beats the bigger guy in the end. This isn’t one of those stories, at least not if you only look at the final score. But it is the story of how we continually improved our game throughout the match. The story of how we encouraged each other to keep going for 80 minutes with our heads lifted high and pride in our hearts. It’s the story of how Louise Ericsäter, Yesenia Medina, Gabriella Westerdahl, Kristina Petersson, My Sundberg, Caroline Lindberg, Anne Franzén, Mia-Maria Nordlund, Malin Olofsson, Anna Thynell, Jorun Borggren, Martina Vivlund, Emmy Westerdahl, Lisa Hulthén and Maria Alvarez performed together as a team filled with love of the game and a will to play, and play hard, no matter what. Team awards: Emmy Westerdahl became Lion Tackler and Kristina Petersson became Rugby Queen. This entry was posted in Match Report on May 30, 2011 by admin. 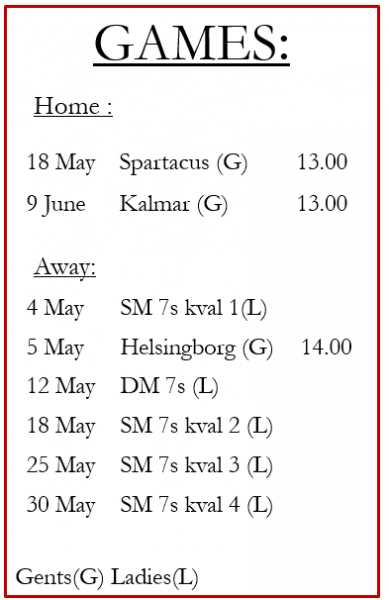 Tomorrow will see a double header at Lugi’s home ground, Central Idrottsplatsen. At 1pm the girls kick off against Uppsala. This will be followed by the men’s game at 3pm against Karlstad. Come down and see Lugi (hopefully) teach those northerners a thing or two about how to play rugby. This will be followed by an all evening party: “When I grow up…” So remember to bring your eyepatches, fireman helmets and cowboy boots. If you have not paid club or social membership (or intend to bring someone who has not) please let us know so that we can put them on the door list. It should be another great day of Lugi Love. This entry was posted in Festivities, Men's Team, News, Women's Team on May 27, 2011 by Jim. After training last Thursday Facebook was humming with anticipation for the weekend’s game. Lugi vs Malmö. The big one. Malmö finished on top of our division last year. They have a lot of experience and have been playing together for a long time both in Sweden and abroad. But off the back of their narrow loss to Karlstad, the Lugi boys sensed that Malmö could be in store for another upset. This passion – if at times a little unguarded – was wonderful to see; something that we have lacked in the past when up against the physical Malmö lineup. From the kickoff it was clear that this passion would make for an entertaining brand of rugby. Lugi were gallant in defense. Antonio “The Hedgehog” Privitera and “Vicks” Cordes were brilliant early, stopping the Malmö crash-ball centre combination before they could reach the advantage line. The forwards too showed their strength in tight, with Nick “Who?” Jewitt and Johannes “Preacherman” Imberg putting their bodies on the line to slow opposition momentum. At one point, blood streaming from his nose, the “Preacherman” trotted swarthily to the sideline. A few moments in the steady hands of “Doc” Leishman and the patched up priest was back on the park. On occasions we were slow to react defensively on the blind. “Lungs” Heredero, a man vociferous off the field, struggled to organise nearby team mates on it. But every time the ball came back his way, the gaps were closed. “Lungs”, forsaking all concern for personal well-being, time and again threw himself into the path of bigger men. If he didn’t always stop them, he sure slowed them enough for the sweeping cover defense of flanker Iain Lednor and fullback Kalle Qolicokota. With the ball in hand Lugi looked dangerous. Periods of slow phase building in the midfield were punctuated by some clever kicks from “The Hedgehog” Privitera and “Johnny” Mackay. Lindängen can be a breezy place to hold a game of rugby and in the first half, these two gentleman used that to our considerable tactical advantage. But it wasn’t just the weather mind. When forwards “Dunning” Cifani and “Eales” Lednor tried to replicate, their efforts were met with considerably less success. Lugi struggled to turn phases into points however; the early discipline of the Malmö squad gave us few openings to kick for goal. With a new centre pairing and a lack of blistering Finnish fire power out wide, the opportunities to put tries on the board were few and far between. When “Tap-kick” Thylander put “Eales” Lednor over all hands were raised to faces in shock. Did he… Oh my… But a merciful Tomasi Tamanivalu signalled the try and Lugi crept ahead to claim the first half, 0 to 7. It saddens me to inform you, dear reader, that early in the second half the fire in the belly went out. Players started complaining about about injuries, heads bowed and mounting frustration was directed at the referee. When Kalle limped from the field clutching his knee Lugi turned to old heads and reshuffled the backline. We rarely again looked as strong in attack. With the breeze in our faces we were forced to scramble for territory. “Johnny” Mackay continued to find touch but the tactical decision making of his outside backs left something to be desired. Playing on the wing is not as easy as many suppose: a simple mistake can quickly turn disastrous. Having never worn a double-digit number however, I’m not well placed to suggest how we can improve on this. The best thing is probably for us to get our hands as much rugby as we can and study the way that a professional back three work together to create and close up space. Many of the errors in the backline can be boiled down to an unsteady forward platform. All day lineouts troubled the Lugi forwards. We were slow to react and never looked convincing in the air; I can think of only a handful of occasions in which our throw escaped the clutches of Malmö’s front jumper. While new weapons have been added to our arsenal since the season began, they proved ineffective. Ten minutes before the game, we were told by the referee, quite rightly, that players are longer allowed to join or leave the line. We tried to adapt but it didn’t work: our five man was not an option. Likewise our use of the short throw failed to travel the necessary five meters and we conceded a great opportunity to attack from inside the opposition’s 22. I think it will be wise for us to strip this part of the game back and work hard at its constituent parts. The accuracy of our throw needs improving, as does the speed of our lift. Only once these aspects have reached a sufficient level should we turn our attention to timing. Similarly scrums in the second half started going backwards. This was in part due the experience and impact of Malmö’s bench, but also to tired legs in the second row and a lack of urgency and communication between the eight and nine. Lacklustre restarts are starting to impinge on our ability to develop other parts of the game. Nick “Who?” kept his chatter up all day, even winning us a penalty at one point when I failed to lift him in the lineout (although I’m not really sure how that one happened). Equally, “The Hedgehog” Privitera communicated well in defence, securing, no doubt, his position in the backline after a brief hiatus due to work. 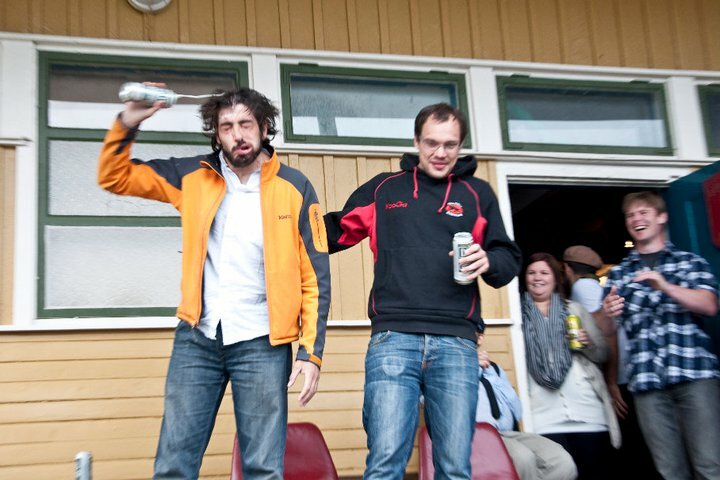 In their first game of seniors’ rugby, Oscar and Johan showed that a stewardship under Peter Ahlgren is a youth well spent. They were great with the ball in hand, easily crossing the advantage line and leaving their support standing still. We continued to see some fantastic individual tackling. Our little men hit low and on numerous occasions brought hard hitting Malmö inside, Christie Suerio, to his knees. Let me tell you from experience that Christie is not a man to hesitate letting you know that he shouldn’t be tackled. Last year he performed on me an impromptu, on-field labial frenectomy with no finer medical instrument than his forearm. No joke. I felt like he’d claimed a part of my soul. Flashes of fortitude returned to us as the final whistle neared and we were unlucky not to close on Malmö’s lead. At one point, pressing close to the try line, a three-on-two overlap was spoiled as the Malmö first-five intercepted a pass, putting to rest any hope a last minute turn around. Again we saw the hard lesson of rugby this weekend: that it is an 80 minute game. Against Helsingborg, ferociousness and spirit turned to our advantage in the last ten minutes for a miraculous turnaround. Against Malmö, we lost passion in the second half and our modest lead was chipped away. Only “Vicks” and Niklas Andersson showed flashes of discontent – rushing to aid their captain following some cynical rugby. Keeping the intensity going throughout the game is no easy feat, and something for which we really need depth on the bench. Final score: Malmö 17, Lugi 7. Try: Iain Lednor. Best on: Andy Mackay. A big thanks to Mats Månsson and Rob Leishman for helping with the subs in the second half and Tomasi Tamanivalu for another even-handed performance with the whistle. This entry was posted in Match Report, Men's Team, News on May 18, 2011 by Jim.